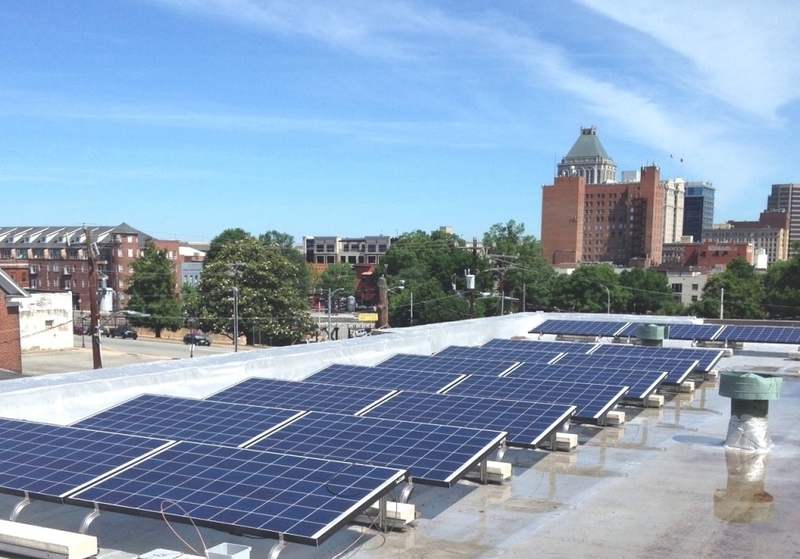 The sun has risen and set nearly 1,100 times since NC WARN installed a small solar power system on the roof of Faith Community Church in Greensboro. And since that time in May 2015, the Durham-based environmental nonprofit has been fined $60,000 by the NC Utilities Commission — the penalty was later rescinded — and has taken its case to the Court of Appeals, which ruled 2–1 against NC WARN. The group appealed and today argued before the state’s highest court that it should be allowed to provide solar energy to the church. Typical of high-level legal battles, the oral arguments dove deep into the semantical weeds: What defines “public”? Is NC WARN “selling” the electricity — verboten under North Carolina law? Is it legally “leasing” the system, or operating in regulatory limbo under a “unique” finance agreement? Three years ago, NC WARN installed the 5.25-kilowatt system as part of a power purchase agreement in which the church pays 5 cents a kilowatt hour for solar-generated electricity. NC WARN has discontinued the agreement and has provided no power until the court case is settled. NC WARN contends it’s the latter. Judge Robin Hudson seemed unconvinced. Reading from the Power Purchase Agreement, she noted that the church “will purchase electricity” from NC WARN. “Are we supposed to read this as not selling electricity?” she asked Quinn. “Yes,” Quinn replied, adding that a previous court ruling considered the “function” of an overall agreement. For their part, Duke Energy, Dominion Energy and the public staff of the NC Utilities Commission have countered that NC WARN is essentially acting as a utility and must be regulated as such. If private entities go rogue and sell electricity, they argue, it would upend the state’s entire regulatory scheme: In exchange for a near-monopoly, Duke Energy agrees to have its rates set by the utilities commission. “It’s our position that it would be unfair to hold NC WARN to contracts that may or not happen,” Quinn replied. To be a utility, electricity has to be sold to the public, Quinn told the court. And NC WARN’s only customer is the church, not multiple customers. In fact, in his dissent, Appellate Court Judge Chris Dillon wrote that NC WARN wasn’t acting as a public utility because one church doesn’t meet the definition of “public. To complicate matters, since the original court filing, state lawmakers passed House Bill 589, complex in the way only a utility lawyer could love. With extensive input from many interested parties, including Duke Energy, the bill legalized third-party leasing of solar power, with certain restrictions. And it and provided higher monetary rebates for nonprofits that want to install rooftop systems — including churches, like Faith Community.